Seize the day and be assured that Newfound Freedom Sober Living Residences are here for you 7 days a week! 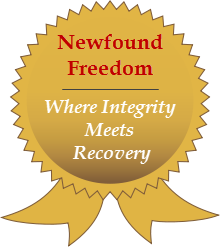 Whether you are currently in the grips of addiction and seeking a way out, or just starting on your journey to recovery and in need of life guidance on a residential level, Newfound Freedom is here for you and remains committed to helping men and women in building lifelong foundations in recovery. This is more than sober living or transitional housing, this is a true course-change that can act as the single greatest catalyst in opening many new doors for a valued future as a productive and sober member of society. Newfound Freedom consists of a network of affordable and structured recovery residences for men & women throughout Levittown and Bristol, Pennsylvania. Our focus hinges on creating realistic foundations in sobriety that are able to withstand the day-to-day rigors of life. Our mission is: "To provide the highest quality of extended care to the recovering alcoholic and addict, in which will enable them to transition back into mainstream society empowered and free!" Our Wildrose recovery home in Levittown, PA - a female phase one residence. The pool at our Blue Ridge sober living home, a men's phase one location. Our beautiful Inkberry recovery residence, another men's phase one home.